We have met our fundraising goal for the ¡Dígame! campaign, which means we’ll be able to print a run of 250 cards. If we can print 1000 the cost goes down significantly, but more importantly, our real goal is to reach people who actually want to play the game and learn or teach Spanish or Japanese (and more languages in the future). If you like this idea and have a blog or podcast or some substantive way of getting the word out, we want you to be part of our outreach team! And, of course, EVERYONE who is part of the team, gets a free deck. If you blog about it or talk about it on your podcast or something like that, just send us a link and your address, and we’ll send you a deck once we do the full printing. We just announced success in meeting our initial goal for the ¡Dígame! Indiegogo campaign to begin selling card games that help people learn Spanish. The game helps English-speakers learn Spanish in a fun way. The players help each other speak Spanish, using only Spanish phrases and non-language sounds or gestures, except during game setup and intermissions. Supporters of the Indiegogo campaign can vote to prioritize or wholly fund the next language, choosing from any of the 30 Mightyverse languages or any other language if they want to help translate. Through this innovative funding and customer collaboration technique, Japanese has been selected for the next release of the game. You can still fund the campaign to help us record of the Japanese phrases or develop new versions of the game for the next language you want to learn! This entry was posted in Uncategorized on June 12, 2014 by sarah. One of the most exciting parts of learning a language is when you can actually communicate with someone else in that language. When you first start learning it can feel like a chicken-and-egg problem – you need to speak in order to learn to speak. Some people spend years in language classes, before they feel like they have enough vocabulary and grasp of the language to hold a conversation. However, time and again, we hear stories of people who successful interact with people in their new language within weeks (or even days!) of starting to learn. Benny the Irish Polyglot suggests “You are always ready to speak a language, no matter what level you are at” and has some great tips for getting started. The secret is to just dive in, and we’ve encoded some simple tricks in our ¡Dígame¡ language game that make that easier. You don’t have to even use our game to get started. We’ve identified 7 phrases that can help you get your meaning across when you have very little vocabulary. You can practice with a language partner before you try with a stranger. In the game, we use these to help players communicate. The neat thing about these phrases, is that each has a corresponding gesture that usually works if you forget the phrase. When you practice using these gestures and simple phrases, you get better at making yourself understood and understanding others when you have very few words. ¿Qué significa? (what does that mean?) You can use the same gesture as “Yo no sé” putting both hands palm up to invite someone to use different words or gestures to explain what they just told you. If you repeat the phrase or word that you don’t understand, then the other person can help you distinguish between not hearing correctly or not understanding. These are three essential clarification words and phrases. You can start with “sí” and “no,” but if you can use the longer versions, it will be a little less abrupt and will feel more like a conversation. 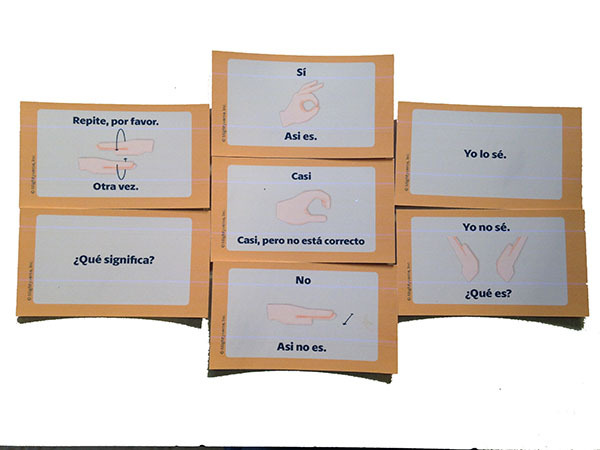 Sí (yes) or Asi es (that’s it) — You can use the ok sign forming a circle with your thumb and forefinger with your other fingers spread upward. Thumbs up also works well. No or Asi no es (that’s not it) — with your hand palm down, move it back and forth. This gesture is more polite than the thumbs down gesture, and will be understood by most Spanish speakers. It is important to be able affirm when you understand or that you still need help. Yo lo sé (I know it) or Entiendo (I understand) — clapping your hands together with delight can be a rewarding affirmation for your language partner who has helped you. Yo no sé. ¿Qué es? (I don’t know. What is it?) — not strictly necessary if you know the other phrases, but some variety can really help move the conversation along. This entry was posted in Uncategorized on June 3, 2014 by sarah.